Red and White Chevron Stripes! 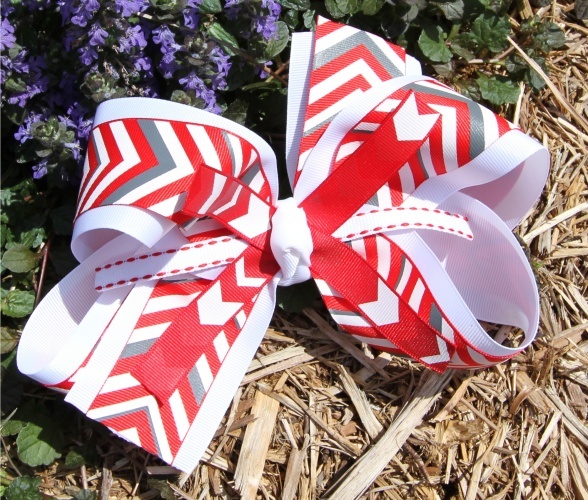 Chevron stripes are the new rave and this bow has Chevron all over it for you! This is a double lined bow that has a white 2.25" white grosgrain ribbon lined with a 1.5" red, white, and gray chevron ribbon. There are two stripes of a 5/8" red and white chevron ribbon in the middle and also a white with red lines ribbon running through the center. A white grosgrain ribbon ties the French knot in the center and it is attached to a French clip.